The main purpose of this form is to populate the VAT Return and then submit to HMRC. 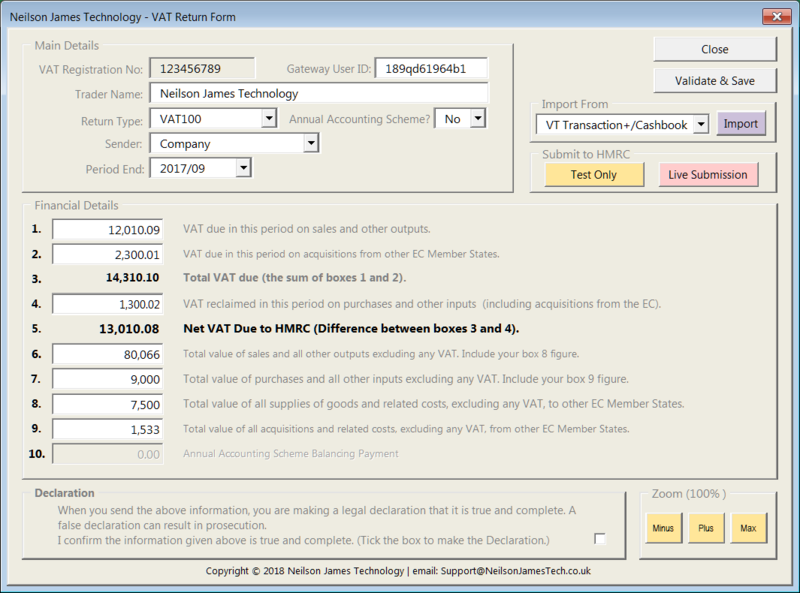 The details can be either entered manually or imported from the custom designed 'NJT VAT Return From' or for VT Software Customers, the details can be imported from the desired 'VT Company' file. In order to minimise the risk of submission errors returned by HMRC, extensive validation is undertaken prior to submission. This validation process can be initiated by clicking on the 'Validate & Save' button. However, the return is validated automatically at the start of the submission process. VAT Registration No: This is the 9-digit number registered with HMRC for VAT purposes. This number will be validated during the submission process. Gateway User ID: This is the User ID issued by HMRC and is required to log on to the Government gateway during the submission process. Trader Name: This is the trader name setup previously. This name can be amended for both current and future submissions. Return Type: Either 'VAT100' for normal returns or 'VAT193' for final returns. Annual Accounting Scheme: If 'Yes' then Box 10 is enabled allowing entry of the balancing payment amount. Sender: Choose from: Company, Individual, Agent, Bureau, Partnership, Trust, Employer, Government, Acting in Capacity or Other. Period End: Format YYYY/MM, where YYYY is 4-digit year and MM is 2-digit month. The application will validate against duplicate returns. Boxes 1, 2 and 4: Enter amount (2 decimal places). Boxes 3 and 5 are calculated automatically. Boxes 6 to 9: Enter amount (no decimal places). Box 10: Enter amount to 2 decimal places (Annual Accounting Scheme only). Declaration Box: Tick this box before submission.